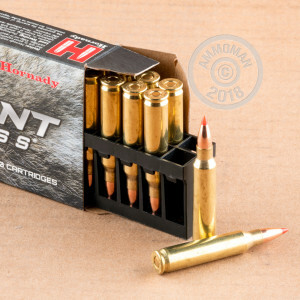 Hornady V-MAX ammunition is designed to take down small game and pests with extreme prejudice. 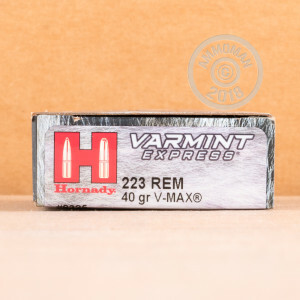 These varmint rounds fire a light 40 grain polymer-tipped hollow point bullet at a muzzle velocity of 3,800 feet per second, producing rapid fragmentation upon striking an animal. 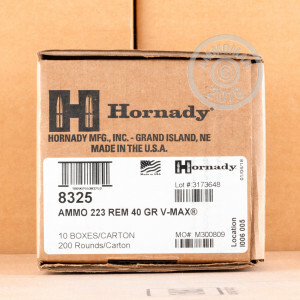 V-MAX ammo is hand-inspected before shipment from Hornady's facility in Grand Island, Nebraska. It uses high-reliability components including non-corrosive Boxer primers and brass cases. If you have a serious critter problem, consider saving some serious money by picking up this 200 round case (10 boxes of 20 rounds each). Remember, all orders over $99 at AmmoMan.com ship for free!